Port Stephens (figure 1) is small a town located near Newcastle on the NSW central coast. In the early hours of July, 1st, what probably started as a waterspout came ashore causing damage to a caravan park. Fortunately, the caravans affected were uninhabited at the time, but media reports suggest it may have been much worse had it occurred during the school holidays a week later. There is not a lot of information available about this event, except that there were reports of thunderstorm activity at the time and possibly some small hail. 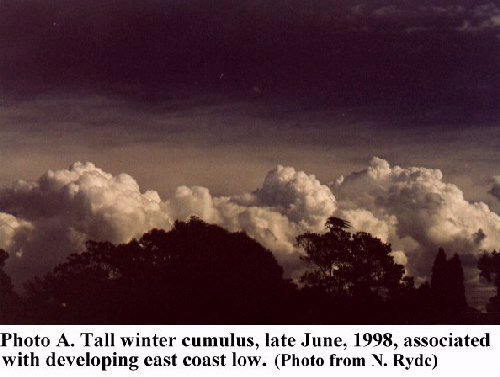 An east coast low which had started over the northern tablelands the day before (figure 2) had moved off the coast and intensified slightly during the night from about 990 Hpa at 2100LCL to about 986Hpa at 0300LCL which is about the time the event occurred. Infrared satellite imagery from the morning of July 1st, shows oceanic convective cells (figure 3). 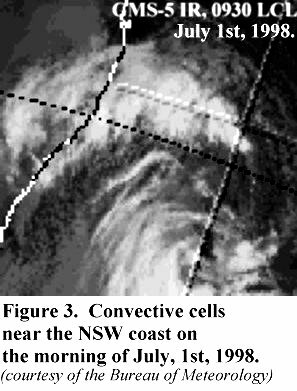 Photo A below shows some convection that was occurring around the time of this low. Although for such a localised and unpredictable event it is difficult to say exactly what processes were involved, it appears that, like similar events in the past, thunderstorm activity has played a role. However, it should be noted that events such as these are quite different from the spring and summer time tornadoes associated with severe thunderstorms which are usually stronger, and longer lasting. The atmospheric temperature profile at Williamtown (near Port Stephens - figure 1) for 0900LCL the next morning (a few hours after the event) shows an unstable layer up to around 600m followed by conditional instability to an inversion at around 2200m (figure 4). It appears that there is a particularly dry air mass above this level with the sharp drop in the dew point. Above the inversion at about 2500m there is conditional instability until a stable layer from about 4580m to to about 5500m above which there is some conditional instability to 8100m. Stability returns from here and the tropopause is at around 9200m. The Total Totals was calculated to be about 49 at the time of the trace - a level which could suggest the possibility of thunderstorm activity. It is interesting to note the Coffs Harbour (Coffs Harbour is located about 300Km further north) trace for the same time (figure 5) has no indication of the dry air mass detected at about 2200m at Williamtown (figure 4). Unfortuantely, the Sydney Airport 0600 LCL trace was unavailable. The storms associated with these east coast lows are usually over the ocean or just along the coast since the warm sea surface temperatures and relatively high mixing ratios would allow convection to occur. The land temperature is too low and so is the mixing ratio for surface air to become buoyant at any level (if it were forced to rise) for Williamtown. This is not surprising for a winter time situation. In the case of this particular event, it is possible that there was some sort of localised surface trough at the time, probably associated with the thunderstorms. Perhaps a convective cell outflow boundary played a role? People living in coastal regions (near the beach) should be aware of the hazard posed by waterspouts and be particularly careful in the cooler seasons when there is heavy thunderstorm activity in their local area as might be the case during an east coast low event. A well built house would probably withstand the intensity of a waterspout. However, there have been some strong waterspouts in the past (such as the July 9th, 1957 Warriewood tornado) but such an event would be quite rare.